If the first year was about getting started, year two of CDPB has seen the building of remarkable momentum. Even a quick glance through the monthly calendar of events will show the extraordinary level of activity of the Centre and those who work with us, especially our Chief Executive, Eva Grosman and Programme Director, Conor Houston, to whom I want to express particular appreciation and acknowledge a profound debt of gratitude. In addition to building on the various on-going programmes like “Unite against Hate” (look inside at the major success of Music Unite) the past year was notable for the EU Debate NI initiative. At a time when there was almost no serious public conversation about the issue, CDPB started work with universities and students, the legal profession, the business community, the agricultural sector, voluntary, community and statutory agencies, the Northern Ireland Executive, the British and Irish Governments and the European Commission to create a thoughtful and informed debate about the EU referendum. In recent months it was widely acknowledged by all sides of the argument that not only had CDPB taken the lead on the issue in Northern Ireland, but also that the open, creative and engaging way in which it was conducted owed much to the approach taken by CDPB. Thanks to Conor and Eva for their leadership, but thanks also to those who gave us the financial support that made it possible, not least the Joseph Rowntree Charitable Trust. While EU Debate NI comes to a conclusion with the holding of the referendum, and some initiatives such as the Leadership Academy were pilot exercises that will be assessed and may be taken forward in the autumn, other programmes like Together, TEDx, the Women’s Enterpreneurship Day (congratulations Eva on being appointed NI Ambassador for this initiative) and our partnerships with the Washington Ireland Programme and Corrymeela have already proved themselves and are an established part of our on-going Northern Ireland programme. Last year also saw significant steps forward on the international front as CDPB welcomed visitors to Belfast and started building the foundations for substantial ongoing partnerships in Britain and Ireland, North and South America and the Middle East. With an enlarged Board of Directors, an enhanced Advisory Board, and a new office base in Belfast City Centre, the momentum is building, and with it our need for more financial resources to help realise the CDPB vision at home and abroad. I guarantee that as you turn the pages of this report you will begin to share our excitement and enthusiasm, and this time next year we may well be reporting on your contribution to this vital work. 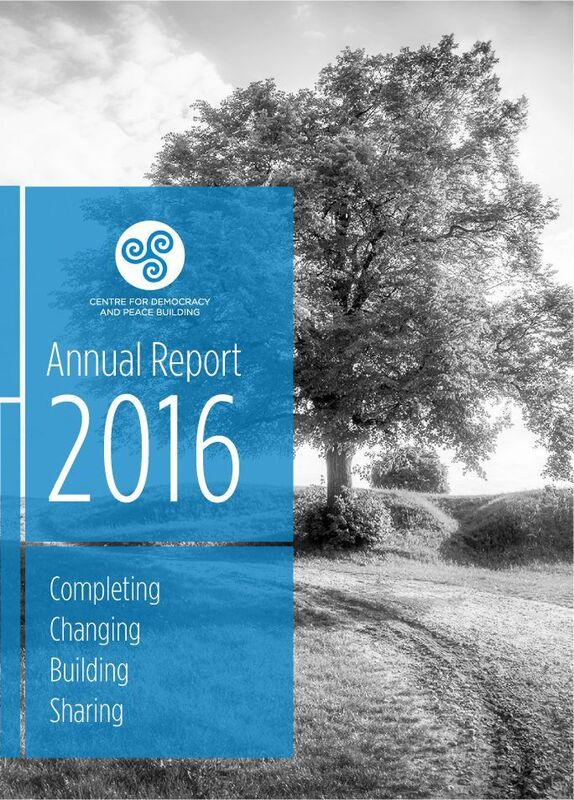 Download CDPB Annual Report 2016 HERE.